Welcome to the first class for 2008 – I hope you enjoy making your own needleroll as much as I did writing this tutorial. For personal reasons I’ve decided to post early, and I’m happy to answer any questions you may have from now as well. If you have any questions just leave a comment in this post and I’ll answer as soon as I can – I look forward to seeing some finished needlerolls at the end of it, and it would be great if you could post your photos so we can all share in your beautiful finishes. If you don’t want to open a WordPress account to post, I’m happy for you to send me the link to your own blog and I can copy across into WordPress, or you can email me the details and I can upload the post for you. Now, on to the fun part … the class is ready to commence! The written instructions for each part come first, followed by a step-by-step series of photos to help illustrate that step. 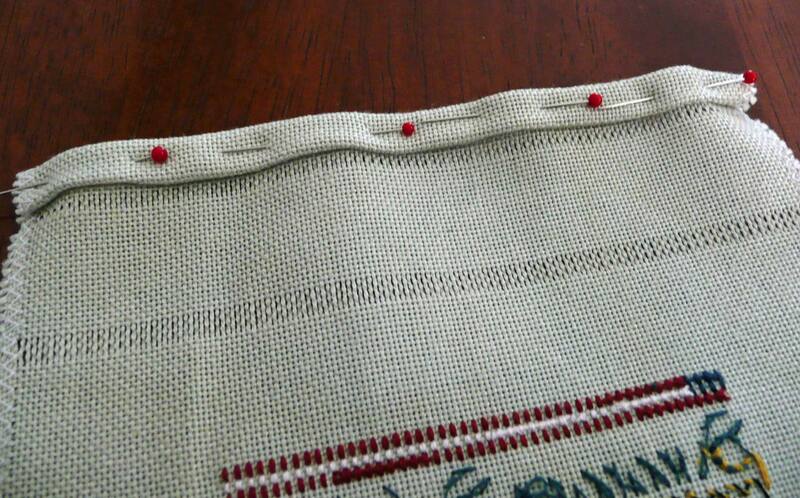 Step 1 – Count about 24 threads up from the top of your stitching, and remove the next thread. 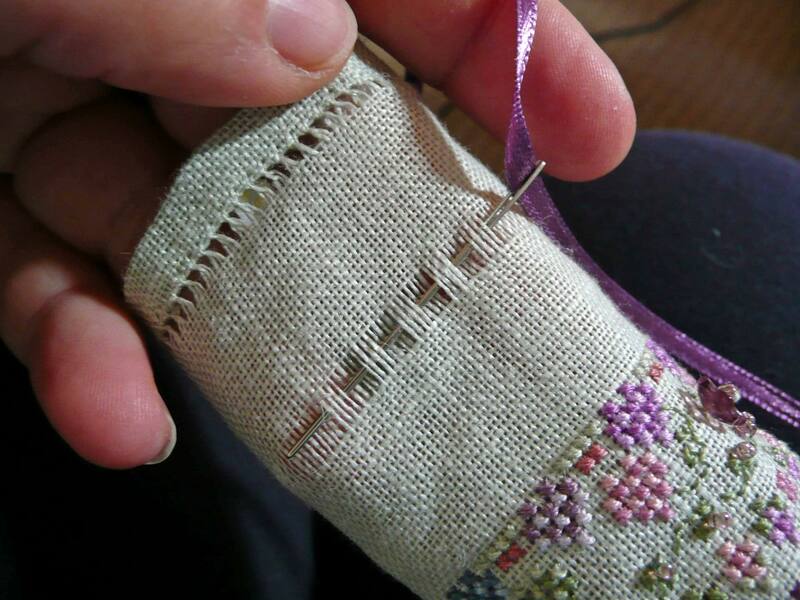 Continue to remove 4-6 threads in total (depending on the width of your chosen ribbon – obviously you’ll want to remove more threads if you have a wider ribbon). 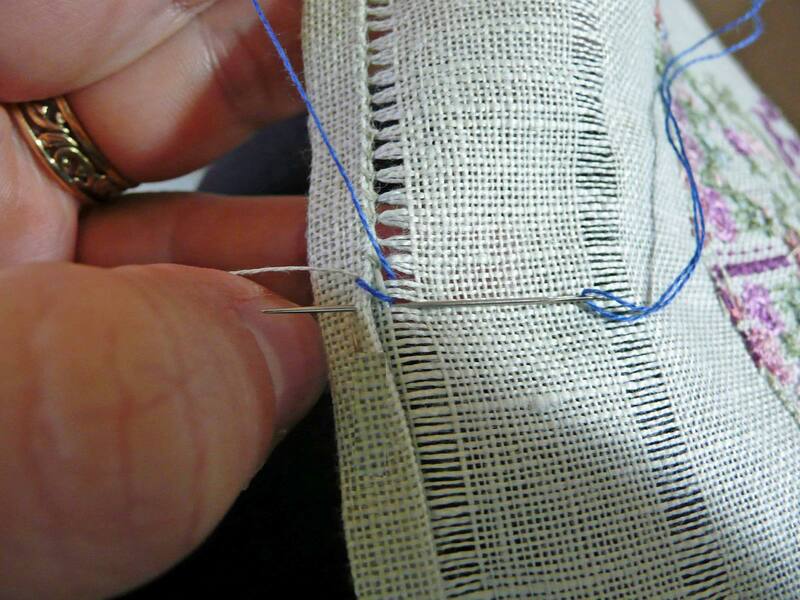 Then do the same thing at the bottom of your stitching by counting the same number of threads down, and removing an equal number of linen threads. 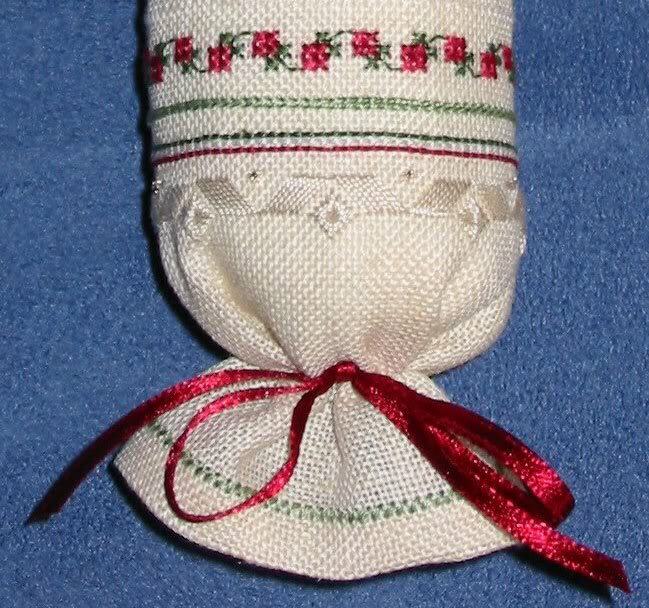 The easiest way to remove threads is to use a needle to pick up your first linen thread, then pulling gently – it will help to run your thumb and finger across the linen thread you’re pulling, as it moves through the fabric, this will help to flatten out any wrinkles and separate the thread from the fabric (some linens are quite difficult to pull through and the odd thread may snap in the process – this is quite normal, so don’t panic – just continue to pick up the thread from where it snapped and continue again). Step 2 – Count another 24 threads above where you removed your last threads in step 1, then remove 2-4 threads. 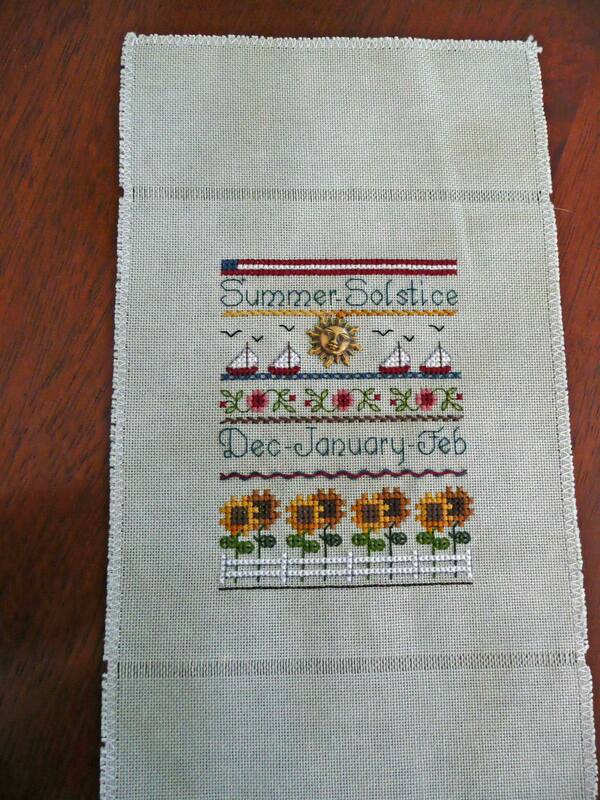 This will be for your row of hemstitching. 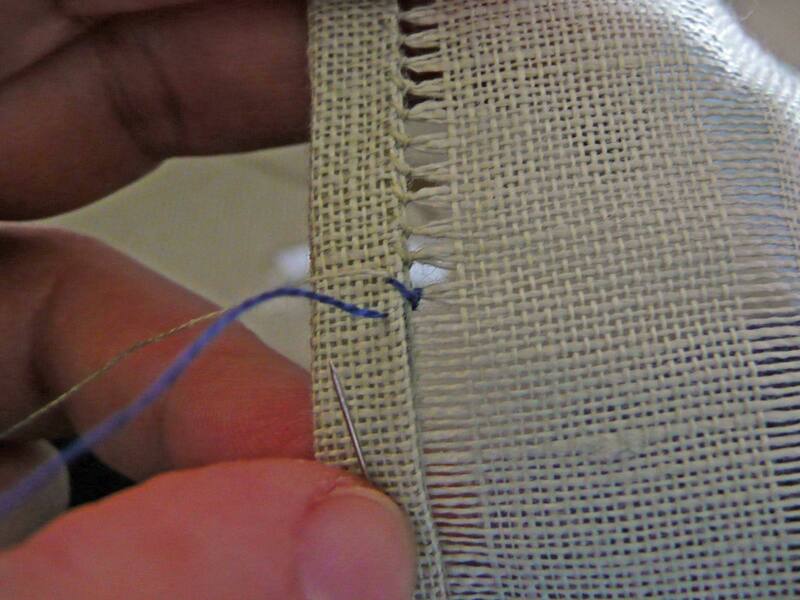 If you want your hemstitching band to be quite small, just remove 2 linen threads. 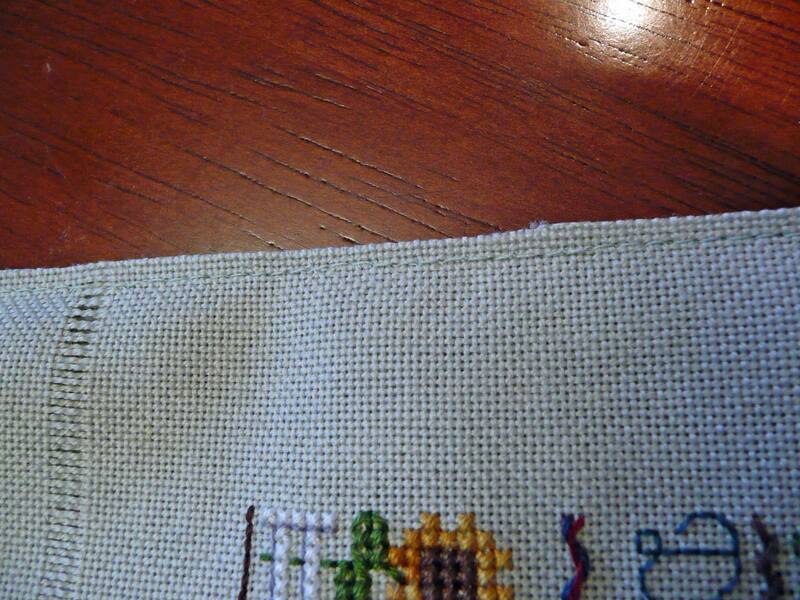 If you want your hemstitching to be more obvious remove 4 threads. In my case I’ve removed 4 threads. 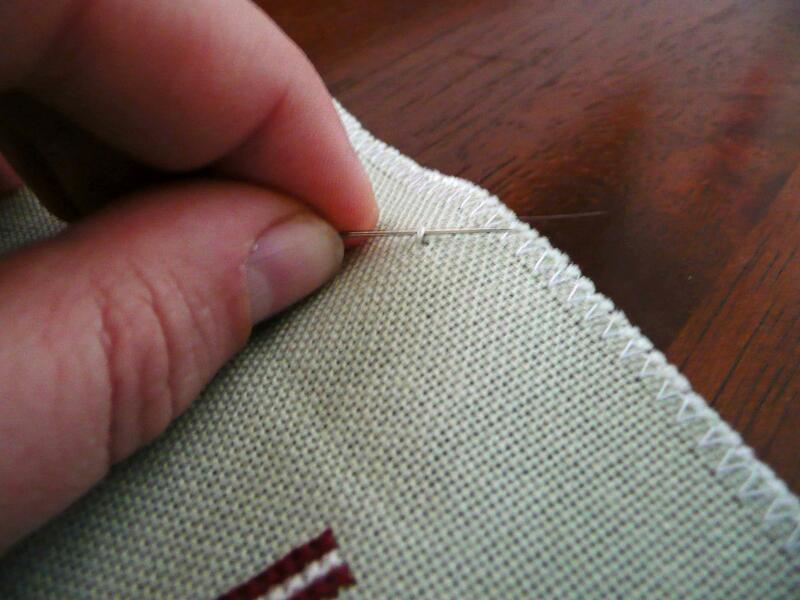 Do the same at both the top and bottom of your stitching. Step 3 – Make sure the fabric above the last line of removed threads is equal to that on the bottom (mine is cut quite wonky/uneven, plus my overlocked edge needs to be cut off along with the excess fabric). 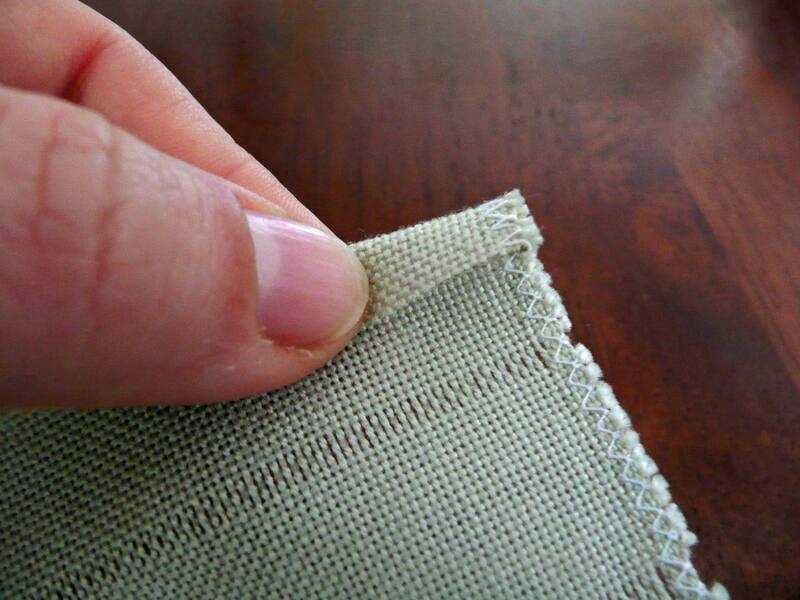 Trim both ends so that you have approx 1 to 1-1/2″ of fabric at the top and bottom. 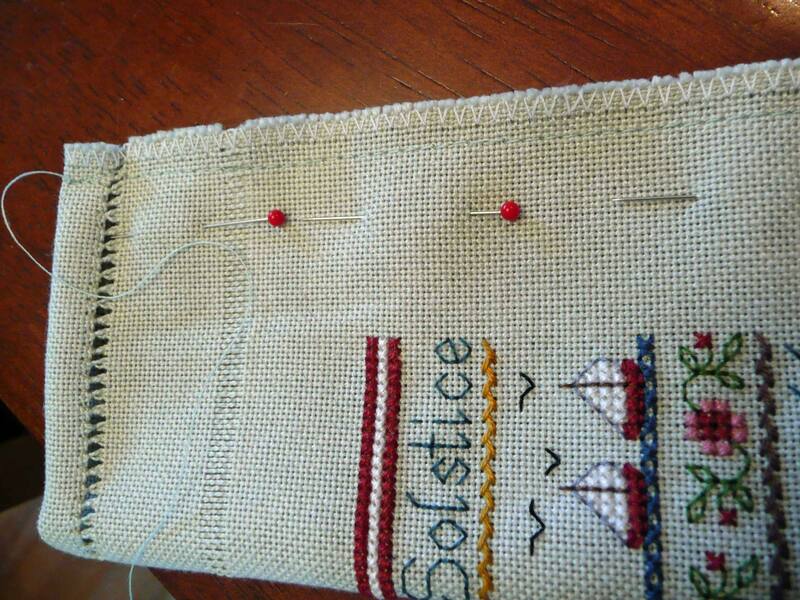 Next turn your stitched piece over so you have the wrong side of the stitching facing upwards. Fold over the top of the fabric towards you, so the edge of the fabric is approx halfway towards the line of removed threads. 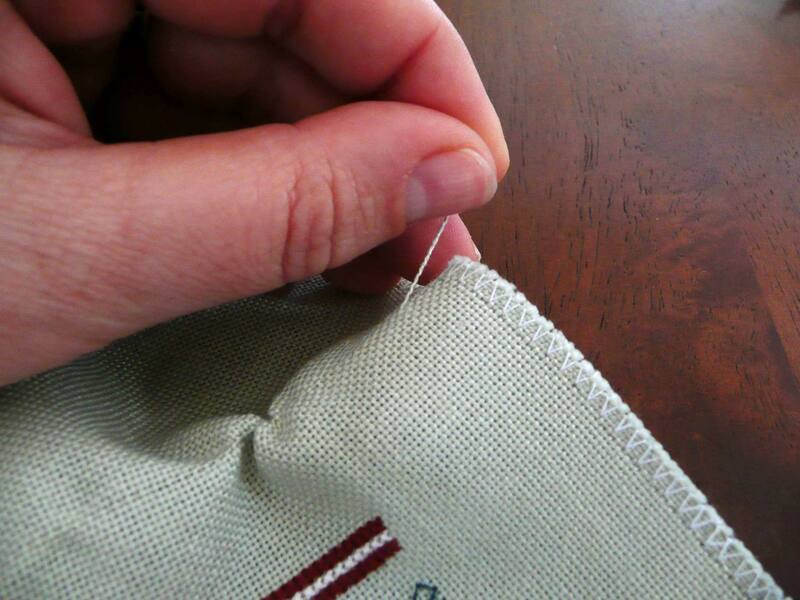 You can either fingerpress or iron your fabric crease at this point – although it’s not necessary it makes it easier to stitch the hem stitching when you have a nice crisp edge. 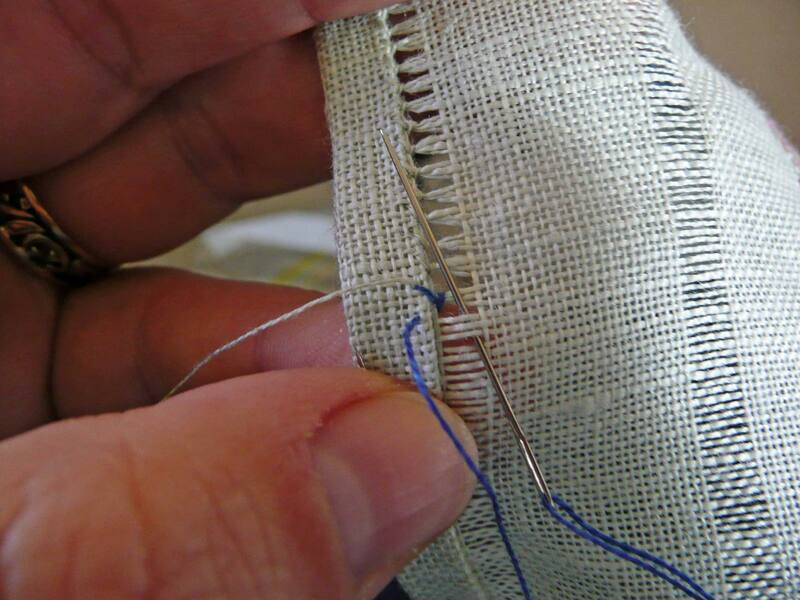 Then fold over one more time, so the crease is now at the edge of the line of removed threads, and use pins to hold in place. Repeat so both edges of the needleroll are finished this way. Step 4 – Hemstitch your fabric – there are some links here to diagrams online, as my photos aren’t very clear to follow: * Hemstitch link 1 * The Victoria Sampler * Classic Stitches I usually prefer my hemstitching to be relatively invisible, so I use a DMC or silk thread to match my fabric. In this case I’ve partly completed the hemstitching in my fabric-coloured thread, then started doing a stitch in blue thread so it will show up for tutorial purposes only. You may, however, prefer to use a colour to match your needleroll and have your hemstitching a feature of your needleroll – the choice is over to you 😀 Note that with my version of the hemstitching, the stitching is done with the wrong side facing you, so the hemstitching is almost invisible from the ‘right’ side. 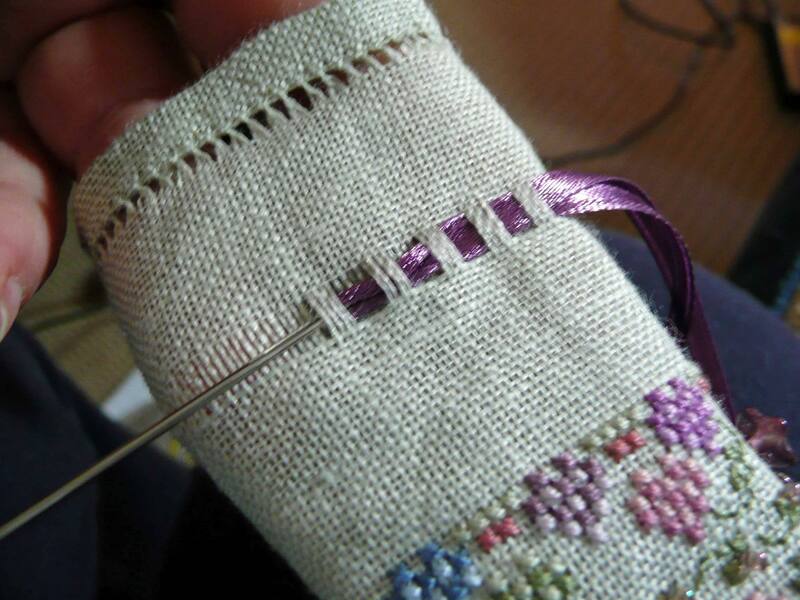 If you prefer to see your hemstitching you would start stitching with your fabric the other way round – that way you will be able to see the ‘tail’ on the right side. 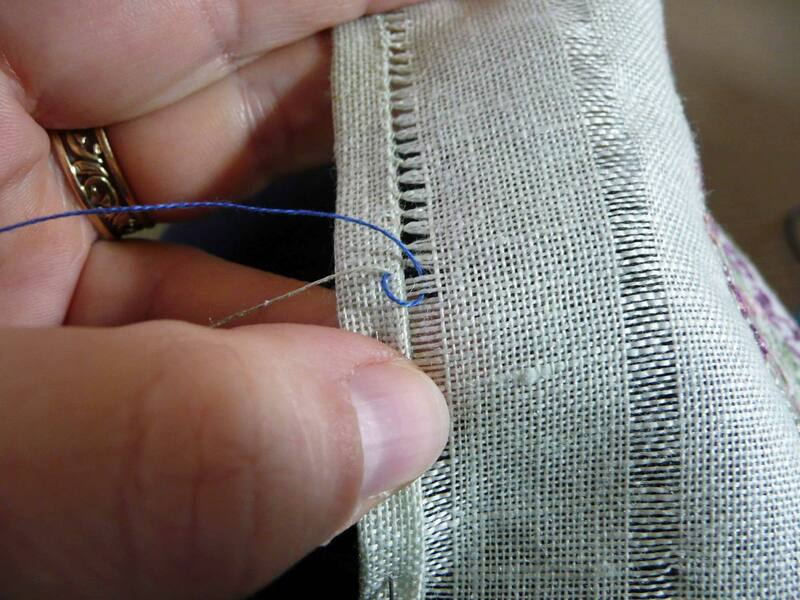 I find holding the fabric this way helps me to get a good stitching rhythm going – feel free to hold it any way that’s easiest for you 😀 Start by stitching a couple of tiny stitches at the edge of the fabric to anchor your thread, then start with your needle at the top of the fabric, through both the ground fabric and the ‘hem’. Pass your needle under 3-4 threads (I usually prefer 3, depending on the fabric), and pull your needle and thread through. 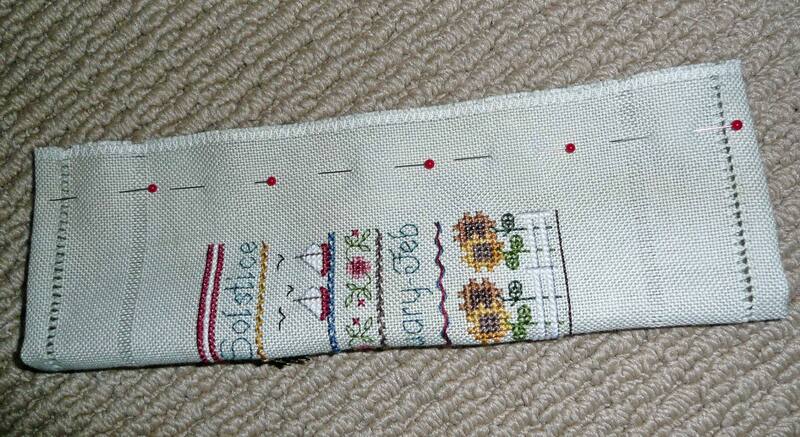 Keep stitching until the entire row is finished, then repeat at the other end of the needleroll. 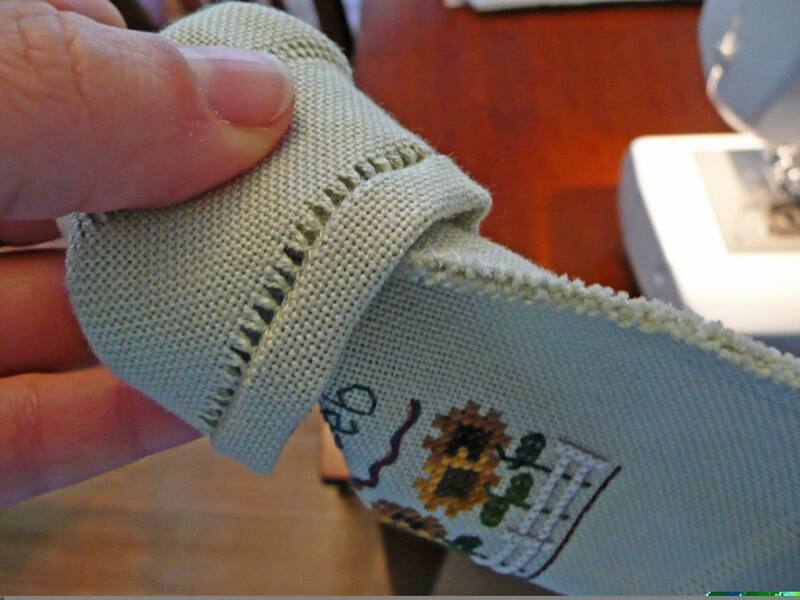 Step 5 – Next fold your needleroll in half lengthwise, with the right side of the stitching facing you. Stitch a 1/4″ seam down the full length, then trim it slightly (I cut it a bit close in this photo, so don’t follow my example!). You don’t have to have a zig-zagged edge on the fabric, mine just happened to be there while I was stitching it to stop it fraying. 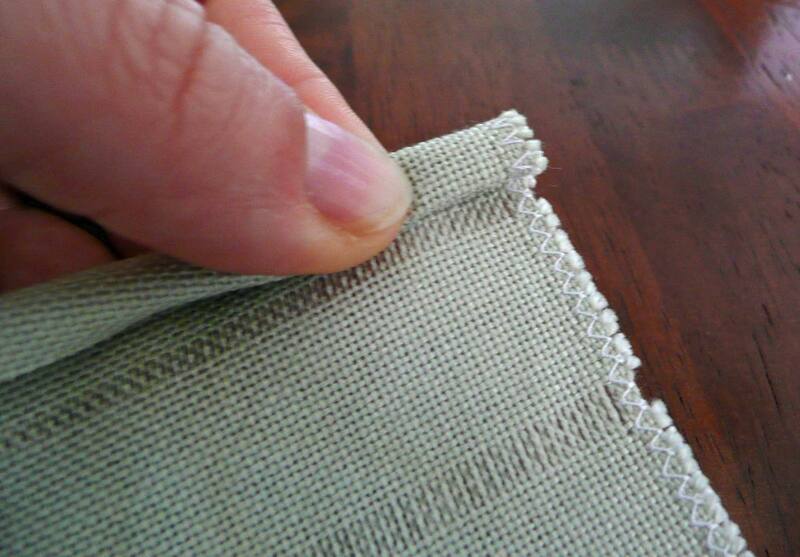 The reason I trim it slightly is because we are going to turn the fabric inside-out again, and do another 1/4” seam – that way you shouldn’t catch the fabric again in the new seam. Remember, you shouldn’t trim it as close to the seam as I did this time! Step 6 – Turn your needleroll tube inside out so the wrong side is now facing you. Step 8 – Time to add the ribbon (or other closure, such as thin cording – about 18” is a good length of ribbon to use for each end) – I fold my needleroll in half using the seam as my guide, and start threading my ribbon about two threads away from the front centre – I pick up about 4 threads at a time, weaving under and over until I reach the front again. I use a large tapestry needle (such as a #22) which has an eye large enough to take the ribbon, and that way there is no point on the needle that will catch on the threads). Pull the ribbon up tight so the end is sealed, then tie a bow. I also trim my ribbon ends at this point once the bow is at my preferred size. 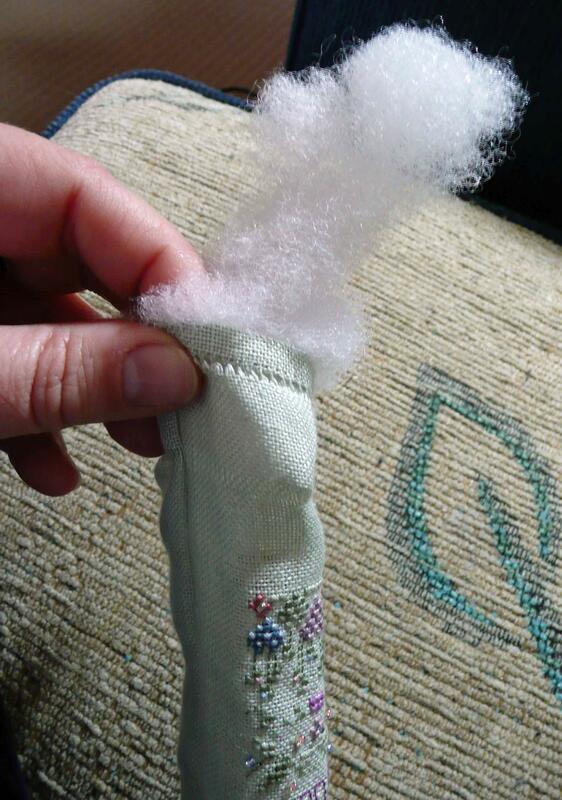 Step 9 – Now it’s time to fill your needleroll with stuffing – I tend to use polyfil as I never intend sticking needles into my needleroll. If you want to use it as an actual needleroll or pincushion you’d be best to fill with a wool filling rather than polyfil so the needles won’t rust. Keep stuffing until you have a firm filling right up to the end of where the last row of ribbon closure will go (I use a chopstick to help push the polyfil down). 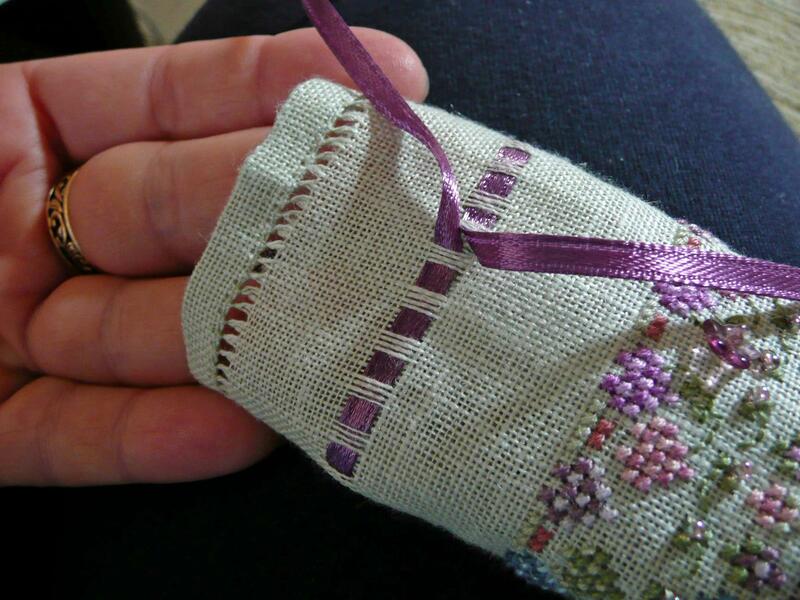 Alternative finishing method – Mayte put together a fantastic needleroll tutorial a while ago on her blog, which shows an alternative method of finishing the hemstitching and the seams. 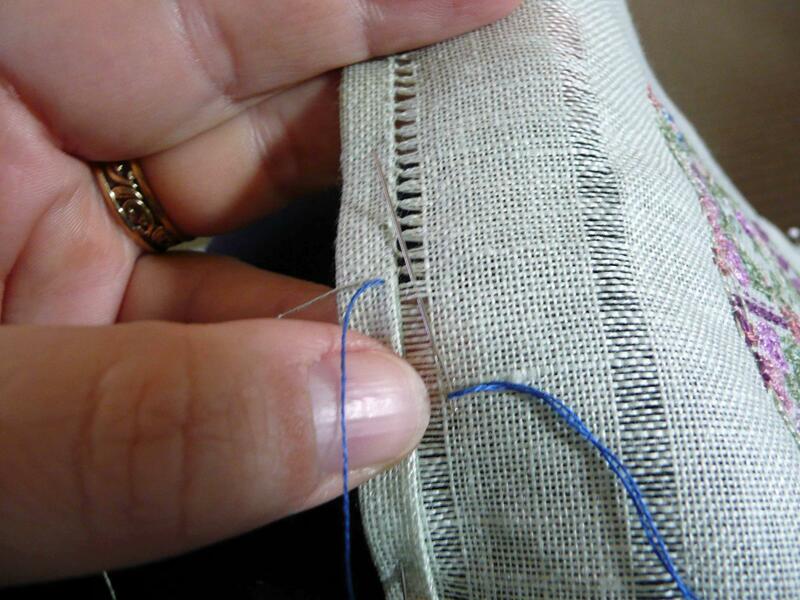 Instead of doing the hemstitching and then stitching a ‘french seam’ you stitch a flat seam first, and then complete the hemstitching – and Mayte does her seams by hand, instead of by machine. You can see Mayte’s wonderful instructions here in Part 1 and here in Part 2. * Classic Stitches magazine– Happy Days Needleroll (you’ll need to sign up as a member – which is free – then head to “Stitching Zone” – Free Charts – select “Trinkets” as the category, and it’s towards the bottom of the list) … this is a hardanger needleroll, though, so the ends are done differently to how mine will be. 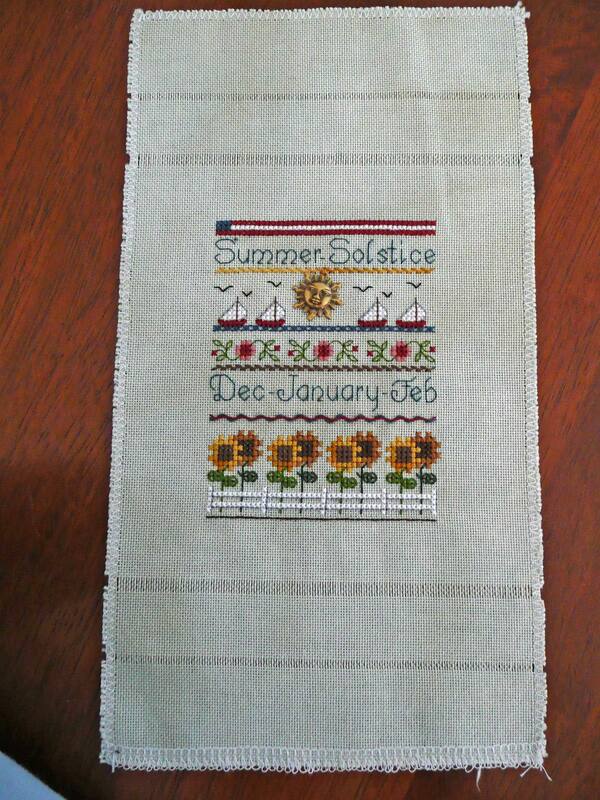 * Jeannette Douglas– Jeannette has some lovely needleroll designs, but the new website design is a pain to navigate – this link takes you to the Mini Topiary series, or the Seasonal series (my personal fave is Summer at the Ocean). 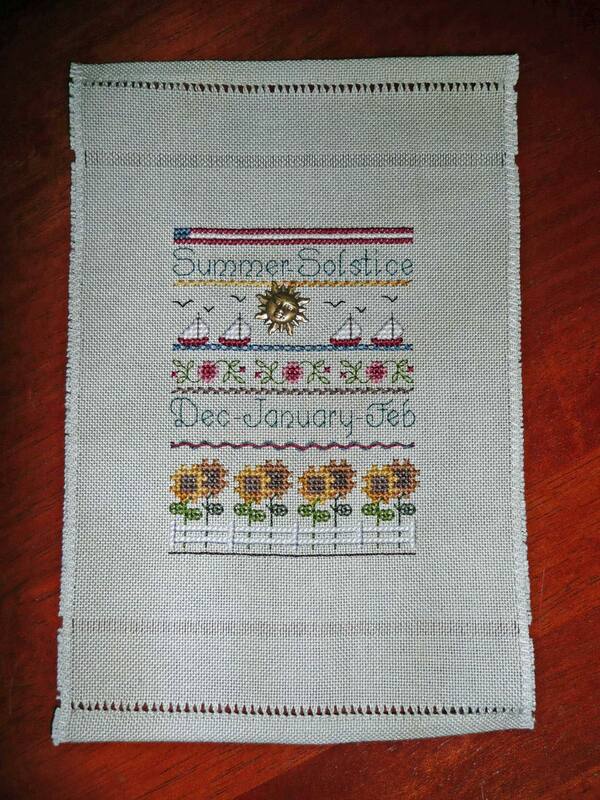 Also don’t forget she has some beautiful ornament needlerolls in the Just Cross Stitch Christmas Ornament issues. 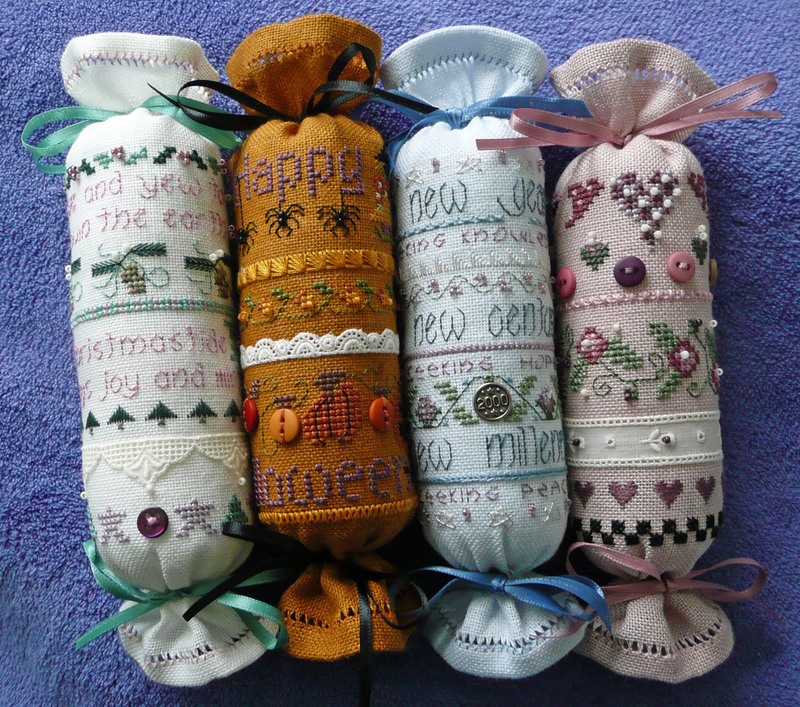 Other designers that have older designs no longer current (you could check out Ebay) is Liz Navickas and Lorri Birmingham (you can see some of Lorri’s designs through Hoffman Distributors) – both have some lovely needleroll designs. Your fabric and stitching can be a variety of sizes, but preferably fabric should be approx 20-21cm (8-9″) x 25-26cm (10-11″). Please bear with me if I’m a bit slow responding with any queries during this week, as I’m moving house in two days time. I will still be checking emails daily, though, assuming my internet connection will be working in the new flat! If you still haven’t seen enough, check out the Photo Gallery here. 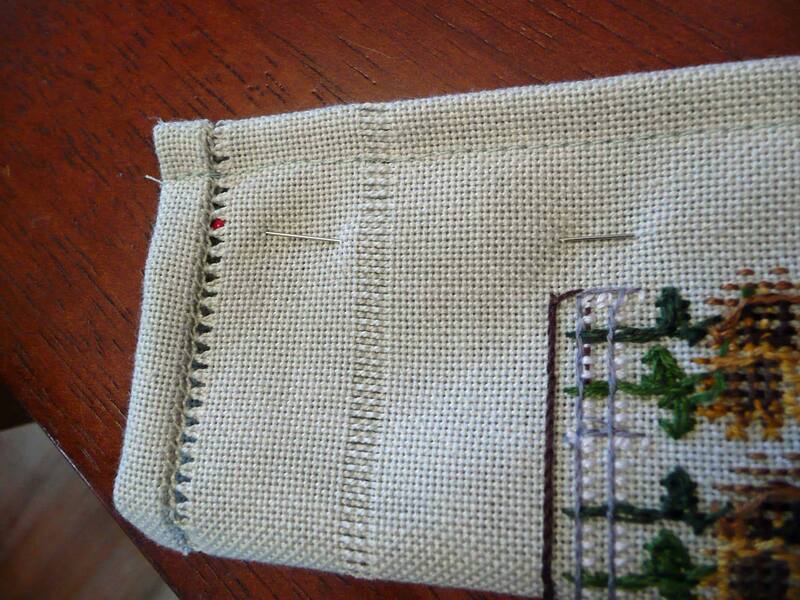 And if you now have the urge to make your own stitcher’s book, there is a tutorial here prepared by the talented Leena. You may remember we held the poll early last year regarding what finishing classes you would like to see as a tutorial. As a reminder, the following list will show which items were requested. I have split the group into two separate lists – the first list covers those items where we have had tutors recommended and I am contacting already, the second list covers those that I would dearly love to have volunteers to help me out. Unfortunately WordPress won’t allow polls on their blogs, so I’d appreciate it if those who want to vote could leave a comment, especially regarding the future hosting of this blog. The next question is related to upcoming tutorials, so I’ll raise a separate post for that question. Thanks in advance for your time in giving feedback, it’s much appreciated.